The Summer Triangle is an asterism that includes three bright stars in the night sky: Vega, Deneb, and Altair. This beacon of warmer weather is observable in the northern hemisphere much of the year, but is highest in the sky in July-August. The stars of the Summer Triangle are each part of their own constellation, Lyra, Cygnus, and Aquila. They are all the brightest stars in the constellation, with Vega being the second brightest star in the northern celestial hemisphere. The only star brighter than Vega in the northern hemisphere is Sirius in Orion. 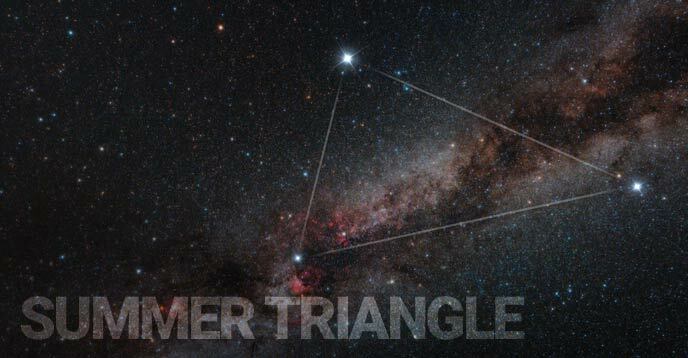 The term, “Summer Triangle” was popularized by the British astronomer Patrick Moore in the 1950’s, although its formation has been noted by many others dating back to the 1800’s. The name can be found in constellation guide books as far back as 1913. Despite being named the “Summer” Triangle, those of us in the northern hemisphere can actually view this asterism for part of the night at any time of year. The Summer Triangle is one of several astronomical asterisms in the night sky. Asterisms are basically a nickname for a formation of stars that are not a constellation. They can span across multiple constellations like the Summer Triangle does, or fit inside of a constellation. The Big Dipper is a perfect example of this, as that asterism is a portion of the much larger Ursa Major constellation (The Great Bear). Constellations and asterisms are fun to photograph with a DSLR camera and wide angle lens. They are often much too large to be captured with a telescope, as these are better suited for the deep sky objects found inside of the asterism. In the photo below, you’ll notice several deep sky objects inside of the Summer Triangle including the North America Nebula, and portions of the Veil Nebula. The 3 stars of the Summer Triangle can be seen in this long exposure image of the Milky Way. You’ll likely notice the brightest star in the triangle, Vega, first. Vega is the second brightest star in the northern celestial hemisphere, the only one brighter is Arcturus. From Vega, travel over to the constellation Cygnus, and find the brightest star in the Northern Cross. This is Deneb, which is star number 2 in our star pattern. Finally, we head to the summer constellation Aquila the Eagle to complete the triangle pattern. Altair is the second brightest star in the Summer Triangle, and includes 2 fainter stars on either side of it. The best way to enjoy the Summer Triangle is to drive out of the city and head for the country on a moonless night. This asterism frames a star-filled, bright section of the Milky Way. A notable feature of this area is the Cygnus Star Cloud, which glows intensely between Deneb and double star, Albireo. Those using binoculars can appreciate this star-rich neighborhood of our Galaxy by looking towards the base of the Northern Cross. Another memorable sight is the nearby Northern Coalsack, which is part of the Great Rift in the Milky Way. The Funnel Cloud Nebula (as referred to by Sky and Telescope) lies east of Deneb, which is the otherwise unnamed dark nebula located here. When Can You See the Summer Triangle? In the northern hemisphere in June, the Summer Triangle begins to reveal its 3 bright stars in the eastern sky as nightfall sets in. This is one of the best times to observe and enjoy this star pattern, as it travels across the night sky all night long. 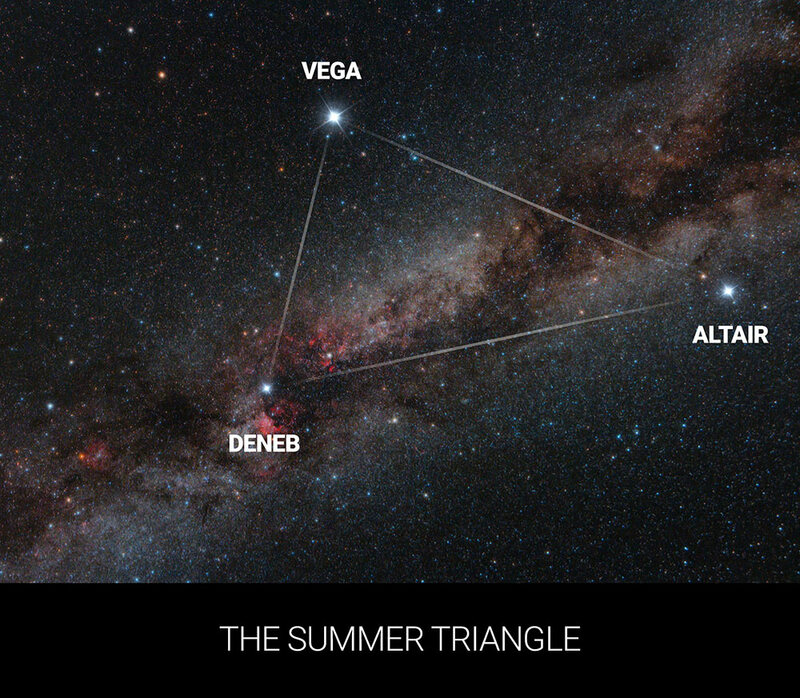 As the seasons change, so to does the positions of Vega, Deneb, and Altair. In the late fall and winter, these 3 stars appear high into the western sky, with its southernmost star (Altair) setting by about 10:00 pm. The lens used for the photo below was a Rokinon 14mm F/2.8 for Canon EOS. The images were captured from a Bortle Scale Class 2 site at the Cherry Springs Star Party in 2018. I have labelled some of the most popular deep sky objects in Cygnus, although they are quite small in this wide-angle image. 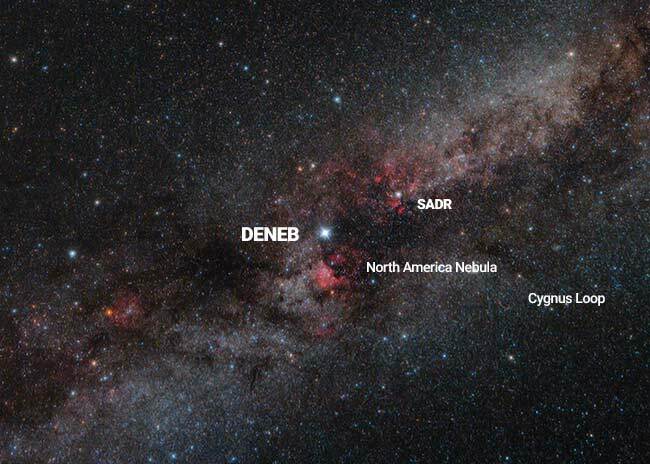 Deep Sky Objects in Cygnus close to the bright star Deneb. Here is a closer look at the North America Nebula in Cygnus, using a 300mm telephoto camera lens. NGC 7000 sits just below Deneb, which makes it very easy to locate and photograph. This nebula is extremely faint when observed visually, but shows up very well in a long exposure image. 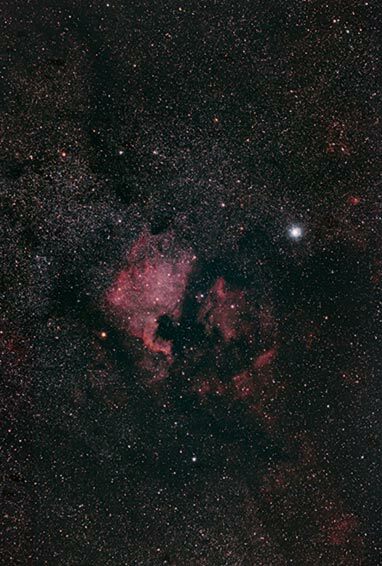 Images captured of the Summer Triangle using astrophotography techniques that improve the signal to noise ratio will undoubtedly contain traces of the hydrogen emission nebula regions in Cygnus. The North America Nebula and Pelican Nebula in Cygnus, along with nearby Deneb. Cygnus is not the only constellation associated with the Summer Triangle with fascinating deep sky objects within in. There are some noteworthy targets in Lyra as well, including a well-known planetary nebula known as Messier 57, or more commonly, the Ring Nebula. Vega is a blueish white main sequence star with a magnitude of 0.03. From the northern hemisphere, it is strikingly bright and noticeable in the night sky. 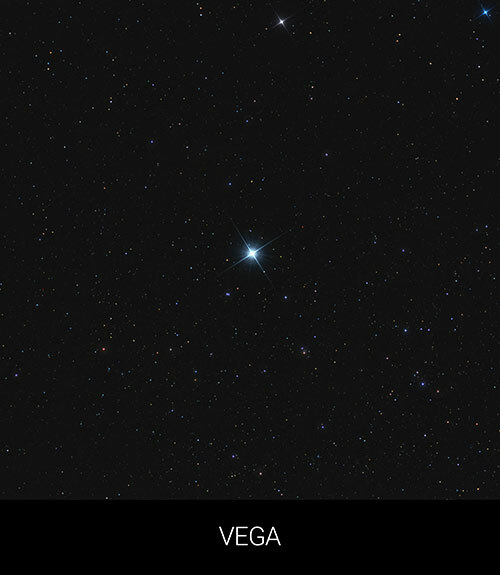 Vega is 40-times more luminous than the sun, and one of the most luminous stars in the vicinity of our solar system. From an astrophotography perspective, Vega has a number of advantages. It’s an excellent star to use when focusing your telescope when using a Bahtinov mask because it is extremely bright. The ultra-long star diffraction spikes created by Vega can help you achieve an accurate focus of your telescope. Another benefit Vega has for astrophotography is its convenient location in the night sky for star alignment. A 3-star alignment routine can be used to calibrate the pointing accuracy of a GoTo telescope mount. Because Vega is so bright and reaches high into the sky, it’s one of the most useful alignment stars you could use. As a matter of fact, each one of the 3 stars that create the Summer Triangle are handy choices when it comes to aligning your telescope mount. For tight spaces such as a backyard patio, there is a good chance that at least one of these stars is visible at most times of the year. 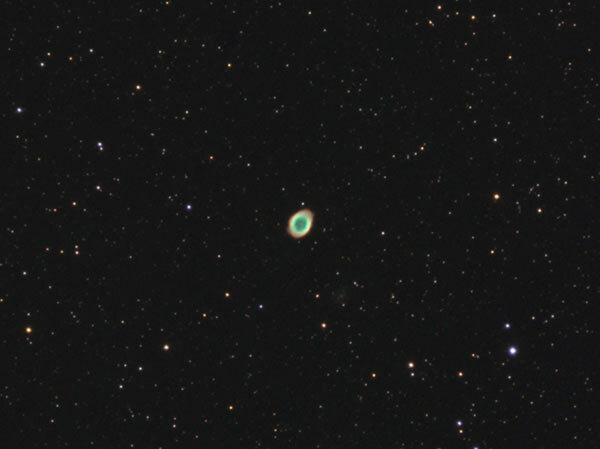 Messier 57 (The Ring Nebula) lies in the constellation Lyra, not far from Vega. Altair can be identified as a bright star in Aquila with 2 fainter stars on each side of it. I often use Altair during the star alignment process of my equatorial telescope mount. The core of Milky Way begins to reveal itself in an impressive fashion just below Altair from the northern hemisphere. Being the most southerly star in this asterism, it is also the first to set in late November around 10:00 pm. The rising Summer Triangle asterism in the late spring signifies the return of summer in the northern hemisphere, and a fading triangle to the west means winter is here. To me the Summer Triangle signifies the heart of the summer astrophotography season, where the nights are short and warm. It is one of the best times of the year to enjoy astronomy because you can comfortably sit under the stars late into the night. Once you have familiarized yourself with this asterism, it will be hard to ignore whenever you see it in the night sky. Share this information with your friends and family so they too can appreciate our incredible night sky on a deeper level. To learn how to capture wide angle images of the night sky using your DSLR camera and lens, have a look at my top 7 astrophotography tips for beginners.